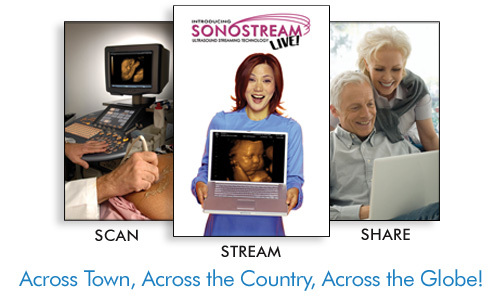 Our exciting new Sonostream LIVE technology will allow you to share your 3D ultrasound / 4D ultrasound experience LIVE – in real time, privately across the Internet with anyone in the world! New features added allow you to watch when you want and where you want with our on demand for iPhone, iPad and Android and Tablet devices. And Moms, don’t forget that you can save the video and relive the experience any time you want. Using a secure broadband Internet connection and our password protected site, your friends and family can now experience the sights and sounds of your 3D ultrasound / 4D ultrasound session with you, both live as well as on demand! 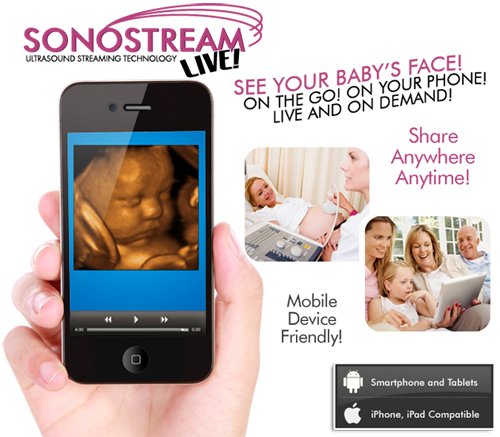 Your ultrasound will also be recorded and available on-demand to anyone you invite. It truly is an amazing way for everyone in your family to bond with your precious new addition…no matter where they are in the world!! Give us a call at (832) 255-BABY (2229) to schedule your appointment. * New Life Ultrasound is a limited diagnostic ultrasound imaging facility. We require that all mothers have documentation of their medical, diagnostic ultrasound. New Life Ultrasound is located in Houston, Texas and serves Katy, Sugar Land, Houston and the surrounding communities. Choose New Life Ultrasound Studio, LLC for your 3D Ultrasound experience.